Unplayer One is a recurring feature exploring games in way that should appeal to those who enjoy art irrespective of the medium. Unlike other review posts, these are likely to contain major spoilers so, if you have any intention of playing the game in question, please do so before reading. People often describe despair as an all-consuming black hole. Whilst that may be its crushing final act, for many people I suspect grey is a more appropriate colour than black. Rather than an oppressive force, it has a tendency to drain away the colour from the world, so that it loses its joy, its allure, and its meaning. 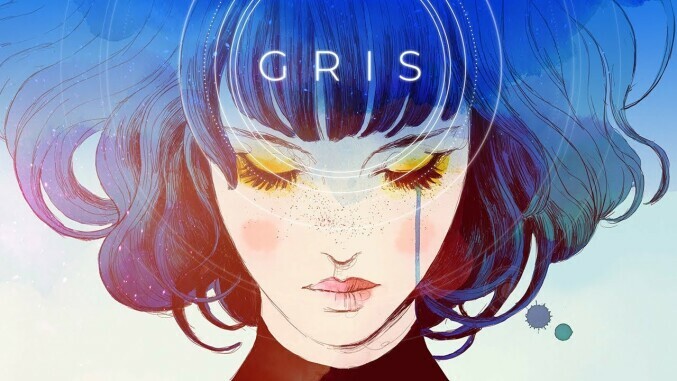 Gris wordlessly explores this concept, following a strong-willed woman standing against the fears, doubts and depression that plague her mind. 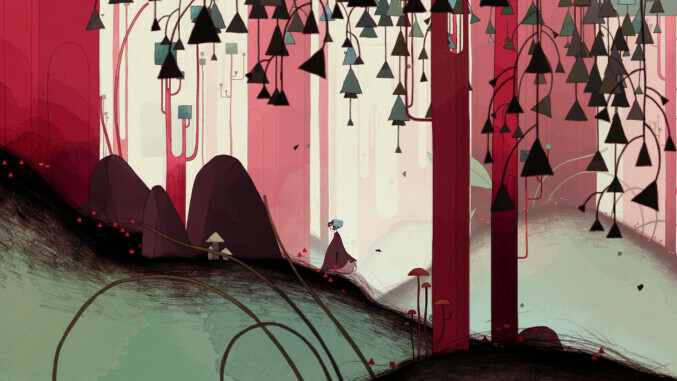 At a basic level, Gris is a 2D platformer in which progression is marked by restoring colours, one at a time, to an initially greyscale world. It is rendered as a flat cartoon against a layered, parallax scrolling background with swirling inks. The beautiful world is striking in both its initial stark simplicity and its colourfully detailed ultimate form. More impressive, however, is the inner struggle communicated solely through its mechanics. The eponymous protagonist awakes in the palm of a crumbling statue that acts as a clear analogue to her own eroded sense of self. 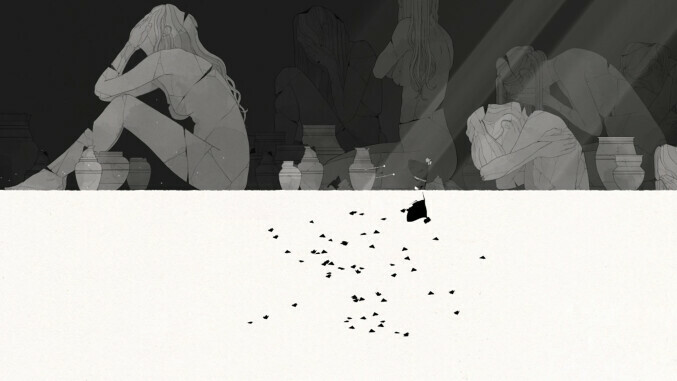 Gris tries to sing out but chokes up, the statue’s hand crumbling and dropping her to the earth below. She trudges through a grey world, hunched body language conveying her emotional state. She is buffeted by winds that rise and dwindle, forcing her to hide behind structures to avoid being blown backward, undoing her progress. After a time she gains the ability to turn herself into a squared off, stone block. This cartoonish power serves not only to allow Gris to explore further by breaking through cracked floors when falling from a height, but the additional weight allows her to withstand strong winds without needing extrinsic cover. The metaphor for resilience is clear: Gris is learning to become more robust. You are not saving this woman; she is saving herself. The wind then shifts from an oppressive challenge to an enabling experience as Gris begins to use vertical gusts of wind to access new areas, previously out of reach. There is a button that, throughout the game, does nothing but cause Gris to exhale in a plaintive sigh. The sound design is real and touching, as pointless as this feature seems to be. However, once Gris has recovered the world’s colour, the same button unexpectedly serves an entirely new purpose as that sigh is replaced by song. We realise that this button has always represented her voice: muted and weak at first, but now rediscovered and liberated. With this discovery, her voice restores life to the world, causing trees to grow and flourish, carrying her higher. It is the rediscovery of her voice that allows Gris finally to combat the formless, inky blackness that has been pursuing her. Her earlier attempts at passive evasion merely to survive now become a defiant challenge. This antagonist adopts at times the more stereotypical mental health motifs of a huge black bird, squawking angrily, and a giant face capable of swallowing Gris whole. When this finally happens, Gris finds herself ascending a tower to escape a rising ocean of toxic black sludge. As Gris sings, her statue self reforms and, moments before Gris succumbs to the rising tide, the statue sings back. This song banishes the creature and the sea of despair. The transition from a sigh to a song represents, to me, a shift from a sense of despair to one of hope. Gris’ ability once more to hope forges positive changes in the world around her. However, finding her voice is not itself the end of the game. It is a tool, and it needs to be taken actively out into the world and shared in order for it to change. Hoping for change is not an excuse not to act. Hope is a reason for not ceasing to act through despair. In What Remains of Edith Finch (which just received the BAFTA for Best Game), following the death of her mother, a young woman returns to a familial home where the physical structure is inseparable from the people who inhabited it. The house was built by matriarch Edie Finch and her husband. The Finch family is believed to be cursed — understandably given their tendency toward unfortunate and untimely deaths — and Edie turns the bedrooms into perfectly preserved memorials to each deceased member of the family. As the family grew, rather than reusing old bedrooms, they simply added rooms to the house in a bizarre, ramshackle way. The first glimpse of the eerily imposing house seems unnatural and unsafe with its cancerous protrusions, but once inside it feels more like an obvious organic extension of its inhabitants. As Edith explores the house, she recalls or discovers the tragic stories of her ancestors through narration. 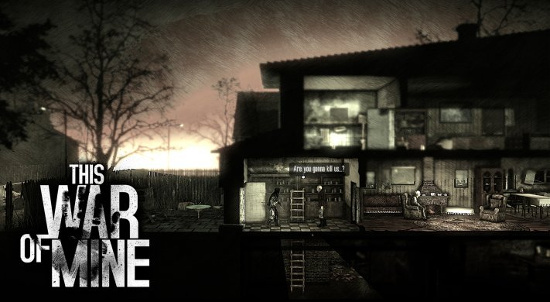 The game falls into a genre derisively described as “walking simulators”, a first person exploration of the house, with the ability to interact with various objects in order to access new areas, reminiscent of 2013’s Gone Home. The shrines to each family member trigger themed interactive vignettes that explore their deaths. It is these tales with their wild aesthetic shifts and merging of the tragic and the whimsical that are the heart of the game. It is a triumph of storytelling and colourful characterisation. Edith’s own plight is that she was denied this family history and connection to her past when her mother tried to abandon it. We are told that it was her mother, Dawn, who sealed off all the bedrooms in response to which an ageing Edie, who continued to view the stories of her cursed family as important, drilled peepholes into each one. The house is cluttered in beautiful detail, all placed with careful intent as each individual’s paraphernalia forms part of the storytelling. Twins Calvin and Sam shared a room but, when Calvin died at 11 (obsessed with space and flight, he launches himself off a swing over a cliffside), his half of the room was roped off and became a mausoleum frozen in time whilst Sam continued to grow. One can only imagine the psychological impact of waking each day to this unavoidable, increasingly anachronistic reminder of his lost brother. Former child star Barbara’s room demonstrates both pride in her success but also how that early success trapped and infantilised her. Her murder is told through the medium of an exploitative comicbook about the events narrated by a Crypt Keeper-like figure who takes perverse pleasure in the tale, no doubt reflective of the media frenzy following her death. One of the lighter vignettes features Edith’s artistic brother Milton, who simply disappeared. A flipbook left behind suggests an intention to disappear into his paintings in a nod to developer Giant Sparrow’s previous game, The Unfinished Swan, featuring its signature melody and visual style. The most poignant sequence belongs to Edith’s brother, Lewis Finch. His day is filled with unrewarding work in a dark, drab cannery. You perform his routine task of slicing fish: reach, grab, move, slice, repeat. It’s boring and repetitive. Your mind starts to wonder, just like Lewis. He begins daydreaming, escaping a simple maze overlaid across a corner of the screen, which you navigate whilst continuing to chop fish with your other hand. Stop, and the fish start to pile up, obscuring your view. Over time, as Lewis’ fantasy becomes more elaborate, the overlaid game increases in visual fidelity and grows to take up more of the screen, until eventually you are performing the job purely by muscle memory. Dissatisfied Lewis imagines himself a heroic and benevolent king, adored by his subjects, with the control and recognition he cannot find in life. Ultimately he disassociates from reality entirely. This was widely regarded as the best level design of the past year, through how it visually and structurally mirrors the psychological process it represents, and how it resonates so strongly with an audience of gamers who recognise that desire for escapism. Dawn takes the loss of Lewis particularly hard and resolves to leave the family home with her daughter. She conceals this intention from Edie until the night before she leaves, causing a rupturing argument. Edie’s own end shortly afterwards is unresolved, which forms a fitting lack of conclusion for the woman obsessed with the family curse and preserving memories. As Edith talks about her experiences after leaving, we discover that the narrated stories we have heard are the memoir that a pregnant Edith wrote for her unborn child after exploring the house and learning its secrets. Edith wishes her mother had shared these stories with her and believes it is important that her child knows the family’s history, in all its tragedy. Edith, it is implied, dies during complications in childbirth, but her son — now the last surviving Finch — receives her memoir and later returns to the house. Although one can run away, severing those family ties is far harder. Edith realises this where Dawn could not. Human curiosity means that we are not simply fascinated by knowledge of from where we come but beholden to it, and that becomes the legacy we bestow upon those who follow — the stories we have lived and the stories we pass on. What remains of Edith Finch? A child, and generations of history. That, and a sense of amazement that our brief lives are experienced at all. “It’s a lot to ask, but I don’t want you to be sad that I’m gone. Sitting in a car at traffic lights and discussing the nature of death with my cousin, whose mother had passed away a few days before, I found myself struggling to communicate an idea and instead explained it through my experience of the game Brothers: A Tale of Two Sons. 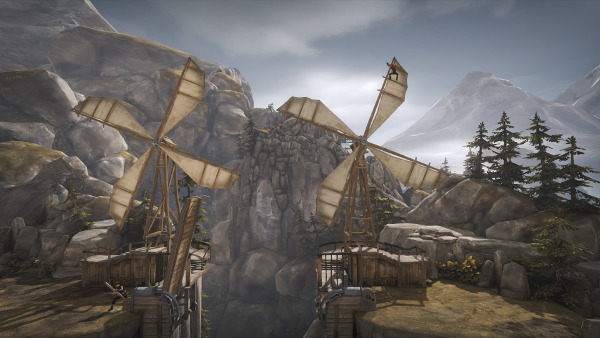 In an increasingly common trend, Brothers was developed by a small breakaway team within a larger developer, Starbreeze Studios, a Swedish studio known for violent first person action games. A thoughtful, beautifully colourful fantasy tale about two young boys was an unexpected offering. The initial premise is somewhat trite: two boys must undertake a dangerous journey to obtain water from the Tree of Life in a distant land to cure their dying father. The control scheme is immediately frustrating, with one half of the gamepad (one analogue stick and one trigger) used for each brother, whom you move simultaneously. It takes most of the game before it starts to feel natural but by the end it is clear that it could not have been designed any other way. Recent ports have brought the game to mobile devices but I think a controller is required for the best experience. The game has no intelligible dialogue but the brothers work cooperatively as they traverse the land and help others they meet along the way. They meet two trolls who turn out to be friendly creatures that the brothers reunite. Nature is routinely their chief adversary, through dangerous animals or treacherous terrain. The game’s prologue shows the younger brother, Naiee, in a boat with his mother during a storm in which she is swept away and drowns. As a result, Naiee has a phobia of water and is unable to swim. Crossing rivers requires his older brother’s help, climbing onto his back and being ferried across. The trauma is deeply-rooted. Towards the end of the game the brothers fend off a giant spider, but not before she mortally wounds the older brother. Although they reach the Tree of Life together, by the time Naiee has scaled its branches to retrieve the water, his brother is dead. He grieves, burying his brother. His sluggish, pitiful movements are affecting, but moreso is the effect on the control scheme. Suddenly you are playing with half the controller, with a single hand, as if you have physically lost a limb. It is a perfect parallel to the overwhelming sense of loss as we grieve the death of a loved one, as if we have lost a part of ourselves. But the game is not yet over and has more to say. Naiee must still return to his father with the cure. The return journey is smooth until, nearing his village, a storm floods the surrounding land. Frozen by the edge of the water, he cannot reach his father without swimming. The boy reacts as he always does near water, pausing, the controller vibrating softly in his refusal to move on. The game offers no prompt, but the solution emerges organically — the absent elder brother’s unused half of the controller becomes the key as Naiee draws on him for strength to proceed. 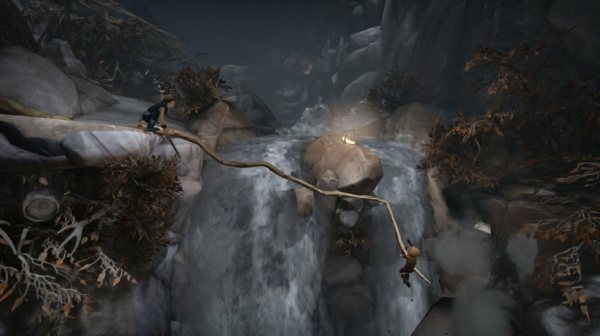 Using both halves of the controller (as you had when crossing water so many times before), Naiee forces himself on, overcoming his fear and saving his father’s life. This, I explained in the car, was my view of death. Irrespective of an afterlife, I find it difficult to view people as truly “gone” as long as we carry them with us. We often worry that the dead will be quickly forgotten but they continue to exist in our choices, our decisions and actions. In truth we only need to worry if they meant nothing to us at all, if they had no impact on us. Brothers was a perfect metaphor for this concept, and one that could not have been communicated so fully in any other medium. As a game, its control mechanics were not simply a way to tell a story but part of the tale itself. In the West too frequently we shy away from discussing death, which leaves us ill-equipped to deal with the absolutely universal experience of grief, as well as our own mortality. Interactive art like Brothers can provide us with shared cultural touchstones and, as a result, better tools and vocabulary to explore these ideas. In the past I have written sporadic game-related posts intended for non-gamers, highlighting new interactive experiences that push the medium forward beyond what most non-gamers consider it to be. Unplayer One will be a new recurring feature exploring games in way that should appeal to those who enjoy art irrespective of the medium. Unlike other review posts, these are likely to contain major spoilers so, if you have any intention of playing the game in question, please do so before reading. 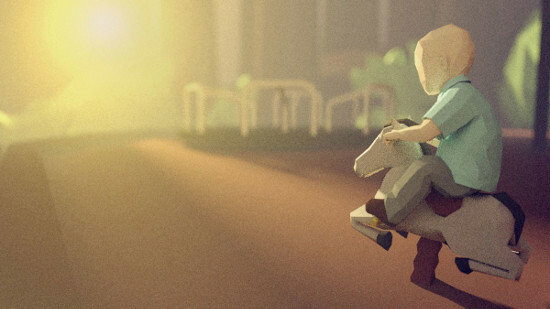 That Dragon, Cancer was always going to be an emotional experience. 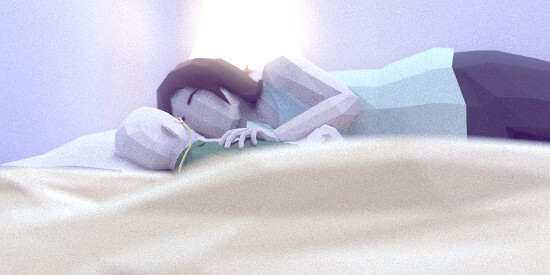 The game was developed by a couple as part of their grieving process after losing their son to cancer at age five, following a long battle with cancer. 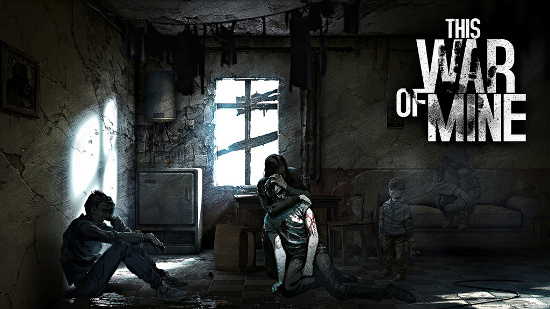 The game received strong support through crowdfunding (notwithstanding some ill-conceived accusations that the designers were exploiting the loss of their son), with many backers having their own experiences losing children or those close to them. Told through a series of vignettes, That Dragon is as much about life – albeit life with a terminally ill child – as it is about loss. We share intimate family moments as well as difficult hospital trips. Grief is complex and the game will mean different things to different people: some will recognise familiar painful experiences but hopefully find solace in the shared experience; others will find it a way to explore one of the most harrowing positions in which a parent can find themselves. Although the proximity may vary, loss to cancer is a universal experience, more poignant at the start of this year with the deaths of David Bowie, Alan Rickman and Lemmy. In any case, I always find an increase in shared understanding to be positive result. 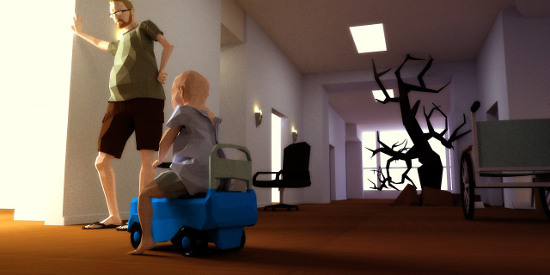 The game uses stylised graphics and a mixture of the parents’ perspective and a floating camera that allows you to observe the family. The gameplay is limited, largely a point-and-click tour through a succession of scenes and narrated letters, but I want to highlight a few moments from the game that spoke to me in particular. When the news is broken that treatment has been unsuccessful, we are free to shift perspective between each of the parents and the medical staff, colouring the dialogue with their internal thoughts. The room, meanwhile, gradually fills with water, morphing into a flooded environment with a boat heading towards a lighthouse. The parents respond in very different ways, the mother relying on her faith as a vessel to carry her through, never giving up on a miracle, whilst the father, a realist slipping into despair, is portrayed literally drowning beneath the surface. He can swim up but can’t drag himself out; the only way to proceed is by heading further into the deep. Simpler moments can be equally poignant, as reminders that life goes on for the family. As the children go to the hospital to spend time with their brother during treatment, one complains that he does not like missing school. The surprise revelation gives way to the realisation that what he really means is that he dislikes having to catch up after repeatedly missing classes. Many scenes comprise short sequences, repeatedly waking in a hospital room next to a bed, helping with small tasks, hours and days merging together. Whilst a game can offer only a fraction of the impact, there can be nothing as heartbreaking as having to experience one’s child in pain, crying incessantly but understandably, taking meagre comfort as sleep ceases their thrashing. Having joined the newly launched generation of videogame consoles by purchasing a PS4, and with a healthy crop of new games now announced, it seems like a good opportunity to look back at the games that changed the medium over the course of the past generation which spanned some eight years. Over that period gaming became a truly mainstream form of entertainment, aided in a large part by the Wii despite Nintendo’s inability to replicate its success. Many developers matured in their understanding of the unique experiences that games can offer by virtue of their interactivity. The games listed below are not necessarily the best games of the generation but ones that stand out as having brought something new to the table. Wii Sports: The pack-in title for the Wii single-handedly won over an entire new audience to gaming and proved the concept of motion control. Unfortunately for the console, the game remained one of the best reasons to own a Wii throughout its lifetime. Mirror’s Edge: A critically acclaimed but commercially unsuccessful new IP, its crisply minimalist visual style turned heads but its real talent lay in its exhilarating free-running that redefined the possibilities for freedom of movement in a first-person perspective. Surprisingly, few games managed to build on this at the time, but that sense of movement seems key to several early games in the new generation. Heavy Rain: Quantic Dream’s approach to interactive storytelling came of age with this dark thriller that let players explore the results of choices they made for the characters in a story that could continue even if several of the protagonists perished. It was often mistaken for a series of quicktime events, but realising player agency in choosing to miss a button prompt to achieve a desired (rather than dictated) result was an important new trick. Journey: An utterly beautiful slice of art in the abstract, Journey’s genius lies in its intentionally minimalist take on the multiplayer experience. Dynamically paired with a stranger as you play, your only ability to communicate is through movement and a single sung note. Yet traversing the world feels so much more fulfilling when shared by even that frail connection. The result both prevents others from breaking immersion and explores our shared humanity. Portal: Valve’s first-person platform puzzler came out of nowhere, delivering exceptional writing that raised an otherwise interesting game mechanic to another level entirely. Genuinely hilarious, the sequel’s scripting deserves to be studied for showing that comic timing and even physical comedy can be cleverly maintained without requiring the player to relinquish control of their character. Bioshock: Bioshock is the other game to be prized for its writing above all else, this time in a more dramatic vein. Whilst the decaying art deco visual design of its world is beautiful, it is the Ayn Rand-inspired story that delivers a rare literary game. Guitar Hero/Rock Band: Sure, the annualisation of rhythm games burned out the audience and those plastic instruments are now filling up closets and/or landfills, but Guitar Hero provided an entirely new way to experience the music you love, whilst Rock Band turned it into a social experience. There was no better party game this generation, in my opinion, and ultimately it led to Rocksmith which actually wants to teach you to play the guitar in the guise of a game. Uncharted 2/The Last of Us: Whilst most games in this list are those finding their own path, eschewing films as inspiration, Naughty Dog proved on two occasions that games should not turn their back on cinematic experiences entirely, because it can be done right. Gears of War: Gears popularised the “cover shooter” which largely replaced standard First Person Shooter run and gun mechanics this generation with a new variant that required strategically sticking to cover to survive. It slowed the pace of twitch shooters allowing for greater tactical consideration. Of course this also led to entire worlds filled with convenient waist-high walls. 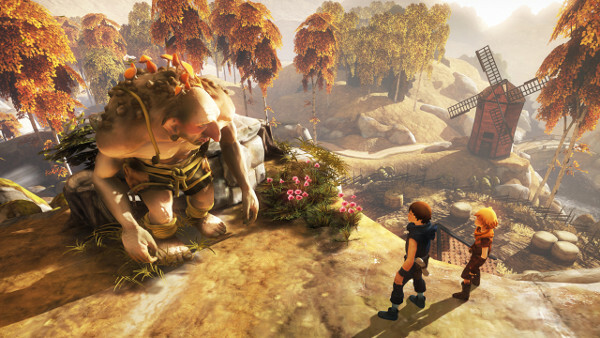 Brothers: A beautiful, low-budget fable about two brothers on a quest to save their dying father, Brothers proved that the very control mechanics of a game (in this case using one half of the gamepad for each of the boys) can be vital to its emotional impact. Brothers could be told as a story in a book or film format, but only by controlling the boys yourself does the final act produce its unforgettable sensation. Dear Esther/Gone Home: There is rightly some debate over whether these “interactive experiences” truly amount to games but for now they fall within the gaming stable. They demonstrated new approaches to storytelling through the creation of a self-contained world, allowing the player to uncover details in the process of exploration. Braid/Fez: Cerebral, artistic platform puzzle games, the ultimate lesson here was that there is a market for pretentiousness provided you are clever enough to justify it. Even if blockbuster titles and rising budgets do squeeze out mid-sized developers, the indie scene is alive and well and will continue to innovate and supply new ideas. Left4Dead: I probably clocked more online multiplayer hours in this game than all others combined because of the invention of its AI Director which would dynamically choose to spawn the zombies and “special infected” that attacked, creating a different experience every time but maintaining a certain sense of rhythm. I have never so enjoyed snatching defeat from the jaws of victory as in its escape sequences. 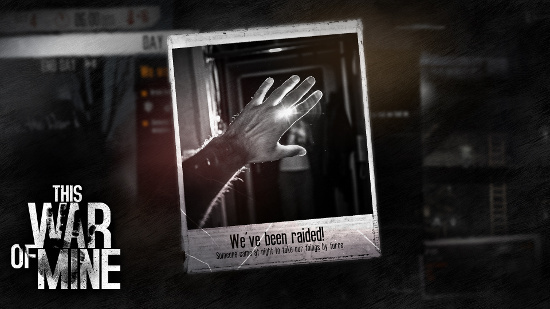 The Walking Dead: Arguably Telltale’s Sam & Max outings should feature here as proving the concept of episodic gaming. But The Walking Dead is where the writing bar was raised so dramatically that everyone took notice. Telltale has proved it was no fluke with The Wolf Among Us, and in 2014 they will be managing four different episodic series. Although it’s too early to look ahead another eight years, huge early sales figures for both Sony and Microsoft make it clear that the nay-saying regarding waning interest in consoles was unwarranted. Players have not abandoned them for portable devices. Some have queried whether the new generation will be the last of the console cycles, being replaced instead by iterative hardware or cloud-powered solutions. Whether or not there is widespread adoption of VR over the next several years will dictate much of this, as it could see a decline in the need to be sat in front of a large living room screen but would also make low-latency systems more essential than ever.